Posted bytVM April 12, 2018 2 Comments on Who Is Your Neighbor? Who is your neighbor? No, I’m not asking the question from a biblical perspective. I am asking the question from a strictly geographic perspective. Who is the person who lives in the house or perhaps apartment next to your house or apartment? Who is your neighbor? While I’ve known all my neighbors by sight and by name, I’ve known no neighbor better than Bobo Dapson when I was a kid living at 422 West Housatonic Street in Pittsfield… that is, until touching down in River Falls. I love River Falls. I love my neighborhood. I love my neighbors. The dead-end street upon which I live extends another half mile beyond my house. That is the direction I normally walk my dogs Hans and Clarence four, some days five times every day of the week. Because Hans is old and slow, and Clarence is young and energetic, I walk them separately. That’s eight to 10, minimum half-mile roundtrip walks up and down the street every day. As a direct result of walking Hans and Clarence, I know 50 people who live on my street by name and chat with them frequently. As I sit writing this post in my office, which overlooks the street, I see Doctor Ben jog by as he prepares for a marathon. His wife Amber is a doctor as well, and she too is a runner. They have two young children. Larry Van Dyn Hoven – a unique name for a unique human being – is my direct neighbor. He and his wife Debi have lived in the house next door for 27 years. 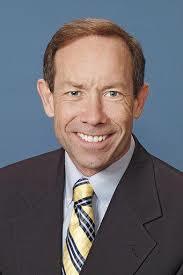 He is a District Manager for American Family Life. I pulled this mug shot from the Internet. We are not drinking buddies, but during my 18 months in River Falls, Larry and I have chatted about anything that enters our brains, several times each week as I stop at the end of his driveway with one of the dogs, or shout from my deck in back to bother him as he mows his lawn. Larry has a snow blower. 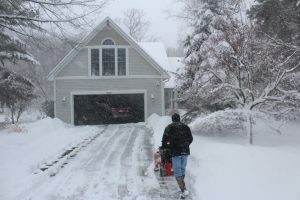 When it snows heavily – which it did frequently this winter – Larry rises early and clears his driveway, but only after he’s cleared mine and three other nearby neighbors’ driveways. While I must be glad and happy for Larry and Debi, I am sad. 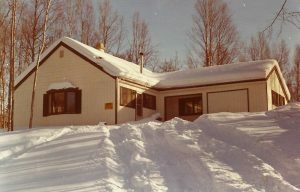 After 27 years, they have decided to sell the house and move to nearby Eau Claire, which is closer to the insurance territory he manages. They close on the house this afternoon. We’ve said our goodbyes. I will greatly miss having such a friendly neighbor. I do not know Larry’s religious affiliation, but he is a true Christian by the only reason that counts: Larry lives his life like Jesus. I smiled a bittersweet smile as they drove away minutes ago. Selfishly, I don’t want them to leave. Typical of Larry, he bequeathed his snow blower to Steve across the street, another wonderful man whom I am blessed to call friend and neighbor. Steve gratefully accepts the mantle. Larry told me this morning that I will like the new neighbors, a young couple with a 3-year old son and a baby daughter. Marie and I look forward to meeting them. The dogs do, too. It’s easy to say, “Mitakuye Oyasin… We are all family” when you have neighbors like Larry and Debi. We will miss them and wish them the best of luck. Who is your neighbor? If you don’t know, walk next door and find out. That is just one small way to make the world a better place to be… one neighbor at a time. It was a coincidence that after we moved into our current house over 2 years ago, I found out my neighbor is someone I taught with for over 20 years. It wasn’t planned. It just happened. Your anecdote, Randy, is yet another reason to take the time to meet the people who live so near to us. By the way, I met my new neighbors yesterday. They are a wonderful young couple with a 3-year old son and an 8-month old daughter.